Sharekhan was founded by a Mumbai-based entrepreneur, Shripal Morakhia in the year 2000. Despite being late in the field, they managed to reach the heights real fast. Sharekhan is everyone’s favorite, because of their grandeur. The offerings they give are the best in the industry but their research is above average and is not as accurate as the top-notch players like HDFC and ICICI. Brokerage charges are % based which are higher in comparison to flat fee brokers. Sharekhan is one of India's leading full-service stockbroking firm having a most credible name in the share brokerage Industry with more than 17 lakh customers on board and having a presence in 575 cities with 2400 offices and franchisees across India. ShareKhan was founded in the year 2000 by SSKI Group and became a subsidiary of BNP Paribas in 2016. BNP Paribas is a leading bank in Europe with an international reach. Sharekhan not only offers online trading facility in equity, derivatives, currency, and commodity having membership in NSE, BSE, MCX, and NCDEX, but also provides financial services such as investment in PMS, MF, IPOs and bonds; advisory, research reports, online education, NRI services, and much more. Sharekhan offers two brokerage plans: Basic Plan and Annual maintenance Scheme (Post Paid / Pre-Paid). These brokerage plans and the charges have been discussed below. Under the basic brokerage plan, no initial deposit is required. Of course, brokerage slabs are higher for this scheme. Long-term investors and customers who are starting to invest in the financial market generally opt for the basic brokerage plan. The advantage is that brokerage structure is simpler to understand. Under the Post-Paid brokerage plan, you have to deposit a certain amount of the margin money into a trading account in advance. The brokerage reduces as the margin money is high. The advantage of the Post-Paid plan is whatever funds you deposit in your trading account is refundable in nature. Under the Pre-Paid brokerage plan, you have to deposit a fixed amount of brokerage in advance. More you pay upfront, the less brokerage percentage is applied to your trading transaction. This plan is different from the post-paid plan, which means, whatever amount you deposit as the upfront brokerage is non-refundable in nature. Sharekhan has all the three modules of trading platform i.e Web-based, Desktop based, and Mobile based application for trading in stock markets. Allows trading in multiple segments (for multiple exchanges BSE/NSE/Cash & F&O/ MCX/NCDEX) from a single platform. 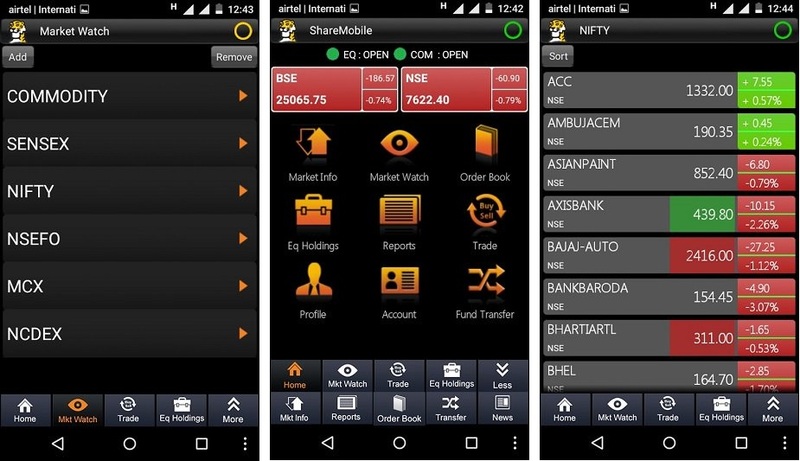 Sharekhan App is an in-house mobile trading app of share khan which is user-friendly and has been designed keeping both traders' and investors' requirements in mind. Listed below are some of the features of the Sharekhan App. Patter-Finder - Scans the stocks in all supported markets every night, based on the standards of Technical Analysis and delivers the information, via SMS and email alerts, before the market opens the next day. Sharekhan offers Online Trading Academy (OTA), a world leader in Professional Trader Education, consisting of qualified instructors and customized courses to understand the basics of trading. OTA has trained over 3,00,000 students. Users have to select the desired Module/Category in order to register for the live training. One of the best ways to learn to be a SELF TRADER in the markets is to sign up for Sharekhan Classroom. 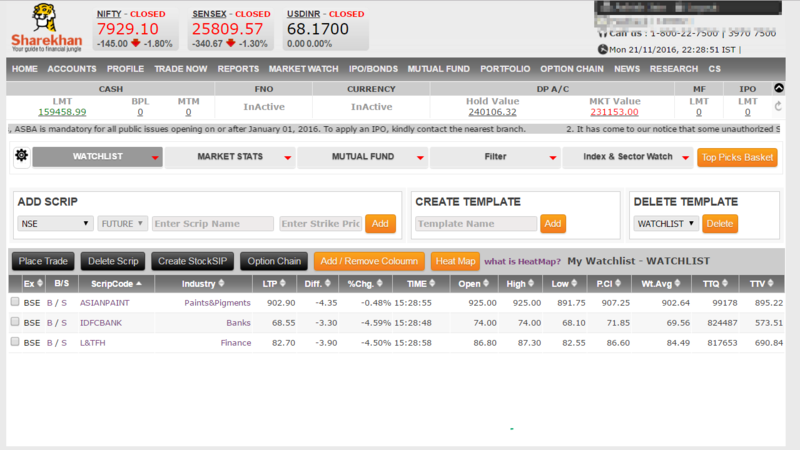 Apart from educating users through online classes, Sharekhan does provide stock recommendations to their clients. However, the quality of these research reports and tips are questionable and is not as accurate as the top-notch players like HDFC and ICICI. Sharekhan online courses are designed to help you, whether you are new to the market or you've got a fair understanding of it and want to learn more, or even if you are a professional trader. ShareKhan has branches/ franchises all over India that help users to visit an office in case of inquiries or any trading issues. Online customer support executives of Sharekhan are decently trained and speak in multiples languages depending on the users' requirements. Without a doubt, Sharekhan lives up to its expectations when it comes to servicing its client base. Sharekhan is a big name in the share brokerage industry with powerful online trading tools, research-based investment advice, and a dedicated customer service. But If your a regular trader, then Sharekhan is definitely not the best choice, as you will end up paying huge brokerage in Intraday trading. The brokerage ranges from 0.5% to 0.25% and the minimum brokerage charge with Sharekhan ranges from Rs 0.1% to 0.2%, as compared to the discount brokers like Zerodha, which is only Rs 20 or 0.01%; hence, you may want to think twice before choosing a broker.